Abandoned railway or blooming park? It is one of the New-York miracles. Nobody could imagine that an abandoned railway will transform and became an amazing park well-known as one of the USA sights. Today I’m going to tell you about this marvelous project. So, imagine: 30-s, Manhattan. The Hudson riverside is enveloped by factories and enterprises. Three districts – Meatpacking District, West Chelsea и Hell’s Kitchen (Clinton) – are united by the High Line railway. Its advantage is that its bed is situated in 30 foots above ground. It was too necessary because the first railway passed through asphalt and the 10th Avenue was called like “Death Avenue” because of frequent accidents. Freight trains were too dangerous for cars and pedestrians. 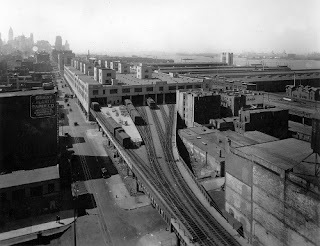 “Air” railway was constructed through the buildings contrary to the real streets network. Such construction was absolutely safe. In 1980s the last train went here. It had only three goods vans and took frozen turkeys. After that the railway was abandon. And then local landowners required to take down the construction. But a social activist Peter Obletz went to the law: he demanded to preserve the High Line and to renew traffic there. Five-years litigation was ineffectual. In 1999 a community “Friends of the High Line” was founded by Robert Hammond and Joshua David. They didn’t know each other but united to preserve the railway. Actually it vexed city authorities and businessmen because Meatpacking and West Chelsea districts have changed their looks. There a lot of restaurants, galleries, boutiques appeared and the High Line was too old-fashioned. 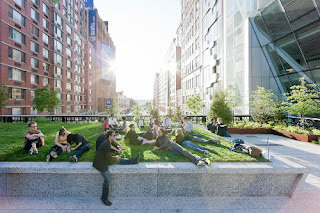 Just designers, architects and social activists protected this railway and wanted to create new public place in NYC. After September, 11th act of terror David and Hammond were ready to their project will be forgotten and there will be other works which are more important than the old railway reconstruction. But thanking to great interest to urban design and planning people addressed to needs of idea again. In 2002 “Friends of the High Line” proved cost efficiency of new public place. They fond out that tax dollars will be more than building costs. City Council said about necessity to renew this place and the NYC major Michael Blumberg offered financial support. 720 architects and designers from 32 countries presented their ideas how to create this territory attractive for NY citizens and tourists. The James Corner Field Operations (landscape designing), Diller Scofidio + Renfro (architect office), horticulturists, communication and safety engineers, artists became their work here. The park building there started in 2006 and all project had a cost about $ 50 million. The South Park Section in Hanswurt district was opened on the 8th of July, 2009. Now the alley extends right up to the 20th St. at length 2.3 km. The works here are being continued to build alley along the whole railway, up to 30th St. at least. Now the section between the 30th St. and the 40th St. belongs to the railway company and the NYC administration is going to buy this territory and continue the park development. High Line Park actually looks unusually. The old rails were preserved at some places, trees and bushes were planted here. As a result there is unique landscape between nature and industrial worlds. Also there is a fine view to the Hudson River, the New-Jersey and the Chelsea district which also transformed to modern art centre last years. Besides there are a lot of installations here, you can see different artists or rehearsing theatre troupes here. There is an excellent infrastructure here: fountains, toilets, deck chairs. It is indeed amazing place even by standards of such multi-faceted city as the New-York. The specialists from Rotterdam, Hong Kong, Jerusalem and Singapore go here to see this “urban miracle” and to be inspired by it. Alan Greenberg (economic development, Philadelphia) says: “Many people are convinced of impressive economic success of this project and want to have the same in their cities, but the question is about possibility to copy it”. But the fact is in any case talented architects and designers can renew abandoned territories in every city.